This project pulls together multidisciplinary teams around their clients, as it has been shown that when people are included in care that is coordinated, they have better health and wellbeing1. To ensure all clients with multidisciplinary care needs in the Chronic and Complex Care Service (CCCS) work in partnership with the disciplines involved in their care to develop and regularly review a shared care plan. Ensures client issues are addressed at the right time, by the right discipline. Enhances staff satisfaction and provides access to their client’s summary of care. Improves the client experience by including them in the care planning process. Provides a coordinated approach to care planning and service delivery. Improves communication and collaboration between clinicians. Improves service quality and efficiency through evidence-based improvements. Reduces service length of stay and associated costs to the organisation. Fosters a culture and framework of interdisciplinary, client-centred care. Despite receiving care from a number of healthcare disciplines, people with complex health problems often experience fragmented care2. A significant number of clients in the CCCS have multidisciplinary care needs that reflect the demographic of Nepean Blue Mountains Local Health District (NBMLHD), with pockets of high disadvantage as well as a large urban Aboriginal and ageing population. The number of people aged over 70 in NBMLHD is predicted to rise by 134 per cent in the next 20 years, higher than the predicted statewide growth of 104 per cent3. These changes will impact the CCCS, due to the increased complexity and cost of service delivery caused by the interrelationship between comorbidities, medication and social issues that are more common in older people4. The CCCS offers a number of services, including nursing, occupational therapy, physiotherapy, dietetics, social work, podiatry and speech therapy. In 2017, there were an average of 113 nursing referrals per month, for clients with an average age of 73 years. The predicted rise of the aged population will increase this number significantly. While data shows that 21 per cent of clients in the CCCS have more than one discipline involved in their care, it is estimated that the need for multidisciplinary input is much higher. This may be due to long waitlists for allied health or a lack of staff knowledge about the role and benefits of input from other disciplines, contributing to a lack of referrals to other disciplines. All disciplines involved in a client’s care meet to plan and review care, but this is on an ad-hoc basis. Currently, there is no consistent or formal process to jointly plan and review the care of clients within the service. In addition, a survey of clients and carers conducted in June 2017 showed they felt confused about the roles of different disciplines and did not feel included in their care planning process. In June 2017, staff surveys, focus groups, client interviews and clinical record audits were conducted and analysed. These revealed a number of issues, as follows. An audit conducted from October 2016 to March 2017 (n=95) found only eight clients had Multidisciplinary Care Plans in their clinical record that listed all disciplines involved in their care. Seven client interviews conducted in May and June 2017 revealed confusion about who the clinicians were and what they did. Clients also did not feel included in their care planning. While 97% of the 70 staff surveyed in May 2017 thought that working with other disciplines optimised client outcomes, they found the process of identifying others involved and coordinating joint care planning with different disciplines difficult, as no formal process currently exists. Clients felt confused about the roles of different disciplines and did not feel included in their care planning process. To address these issues, the following solutions were developed. A list of nurses assigned to geographical areas was developed and trialled at Lemongrove and Lawson Community Health Centres from September 2017, to help allied health staff identify the nurses assigned to common clients. This will be evaluated in early 2018. 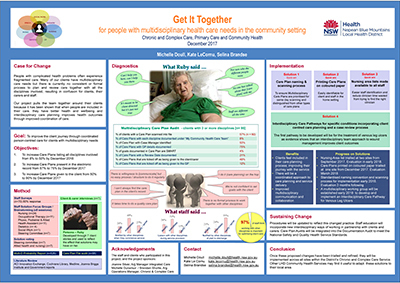 Multidisciplinary Care Plans were printed on coloured paper and trialled at Lawson Community Health Centre in November 2017, so clients can easily identify their plan among other paperwork in their home. This will be evaluated in March 2018 prior to implementation at other sites. A standardised naming convention and scanning process was developed, to ensure Multidisciplinary Care Plans are prioritised for same day scanning and distinguished from other types of care plans. This will be implemented in early 2018 and evaluated after three months. Interdisciplinary care pathways will be developed for clients with conditions where evidence has shown that interdisciplinary care planning and a case review process improves client outcomes. The first pathway to be developed will be for the treatment of venous leg ulcers. A working group will be established in early 2018 to progress this solution. Once this pathway is established and evaluated 10 months later, pathways for other specific conditions, such as chronic obstructive pulmonary disease and heart failure, will also be developed. Implementation – The project is ready for implementation with some solutions being implemented, piloted or tested. A full evaluation will be conducted in December 2018, with each solution measured using a variety of methods, as follows. feedback from GPs and other external providers included in the care plan. It is challenging to narrow the project scope, when involving a diversity of stakeholders, especially GPs. A lack of available data can negatively impact a strong case for change. Remember there is no perfect time to start implementation; a climate of risk aversion can impede change. It is challenging to translate evidence into practice when competing with a number of other priorities for a finite amount of resources. Strong sponsorship and transformational leadership are vital to successful implementation of the project. Ong J. Effectiveness of Integrated Care Pathways in Health Care Settings. Adelaide, SA: The Joanna Briggs Institute; 2016. Xyrichis A, Lowton K. What fosters or prevents interprofessional teamworking in primary or community care? A literature review. Journal of Nursing Studies 2008;45:140-3. Nepean Blue Mountains Local Health District (NBMLHD). Nepean Blue Mountains Local Health District Strategic Plan 2012-2017. Penrith, NSW: NBMLHD; 2012. Commonwealth of Australia. Caring for Older Australians: Productivity Commission Inquiry Report. No. 53. Final Report. Canberra, ACT: Productivity Commission; 2011. Commonwealth of Australia. National Primary Health Care Strategic Framework. Canberra, ACT: Department of Health; 2013. Smith T, Cross E, Booth A et al. The Interdisciplinary Management Tool – Workbook. Southampton, UK: National Institute for Health Research; 2012.